Again, I’m looking into sci-fi food – space food, cyberpunk food, weird food and unusual food. 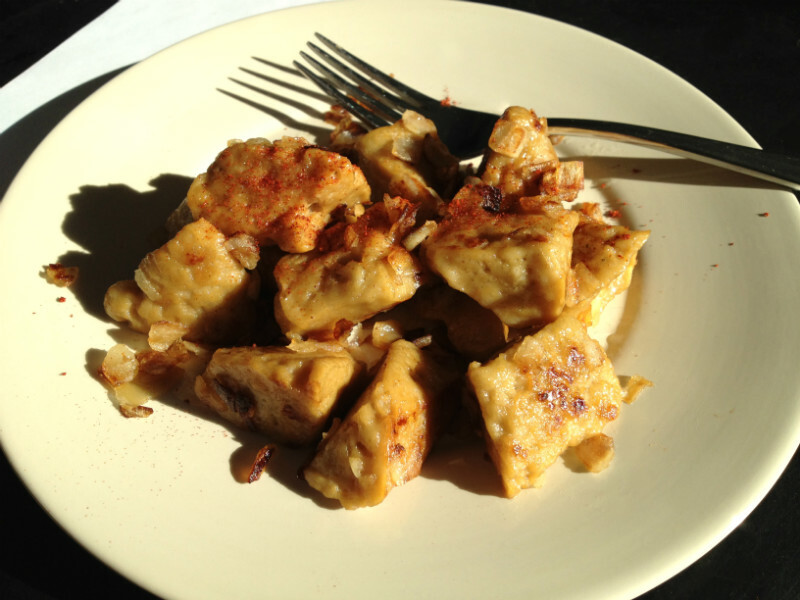 Last night’s obsession was seitan – wheat gluten from flour. Recipe and waffle below. I’m not vegetarian, so most recipes for seitan were a bit convoluted for me – but the basic idea is that you take some flour, make a dough, soak it overnight in water, and then rinse all the carbohydrates out of it in the morning. What you’re left with is a bouncy blob of almost pure gluten – high in protein and historically used by Buddhists as a meat replacement. A common thread in sci-fi is a lack of ‘normal’ meat – whether it’s consuming vat-grown meat, eating Soylent Green (or red or yellow or blue), nomming on insects or genetically mutated alien steaks. The intrepid chefs in the pseudo-Mars experiment have dehydrated-meat on their shopping list – but they also have flour – wheat gluten could be on their menus too! So once I had a blob of bouncy gluten, I cut it into chunks, boiled it in chicken stock for half an hour (and I added some liquid smoke and garlic, because I cannot resist meddling) and then saute’d it with chopped onion. So, how’s it taste? Really rather nice, I thought – though it’s still a little bouncy in texture. Frying at the end really helps – that crisped edge (mmm, Maillard process) gives it some textural variety. Of course, as it is, it’s far too normal – my plans next involve strange shaped cutters, colorings, different stocks and sauces, and even how best to construct fake, edible, alien bones – but for now, knowing that with a night’s preperation and some flour, I can have pseudo-meat on the table is pretty mind-blowing. 3 cups of flour makes what you see above (plus the two bits I ate before the photo) – about 0.94USD at my local supermarket. Not bad, and certainly potential for sci-fi food! Take your flour and 1.5 cups of water, and make a firm dough. Use just 1 cup to begin with, and add any extra water you need. Sit the dough in a large bowl, cover with water, and leave to soak over night. Squeeze as much water and air out. Do not use a paper towel – it will stick to it! Cut into chunks – it’s made of springy, so use a sharp knife. Boil the chunks in stock from your cube and 2.5 cups of water for half an hour – add the smoke and garlic if you fancy. Heat the oil, and saute the onion. Add the chunks until nice and golden on the edges. Serve and eat – in my opinion much nicer than tofu. I love seitan. I can’t wait to try your recipe, thanks for sharing.